Banting diet rebuttal of the high fat coupled with low starch program. Banting diet rebuttal asks just what are the drawbacks of this high fat platter? Based on the teachings of the famous physician, William Harvey, some one hundred and fifty years ago, it is a meal plan which today totally contradicts the modern belief that cardiovascular disease is caused by diet high in animal fats. It's in complete contradiction of the meal plans introduced some thirty five years ago by the biochemist, Ancyl Keys. The low fat fad seemed so obviously right that within a few short years it totally altered the traditional American diet. From butter and animal fats and protein, almost overnight, there was a change to polyunsaturates, margarine and high starch and grain food. Even prime beef had to be grain fed. Wanting to be healthier, the populace turned, en mass to solvent extracted oils and hydrogenated foods, and a diet high in grains and starches; animal fats like butter were eschewed as the villain of the piece. Keys' low fat dietary recommendations had a most unfortunate and totally unexpected side effect; obesity and an epidemic of diabetes became the order of the day. A high carbohydrate diet stimulates the appetite centre in the brain, making Western people ravenously hungry. Another unexpected finding is that it is carbohydrate and not saturated fat that raises cholesterol in the blood. Banting diet rebuttal needs to be considered, before embarking on this high animal fat way of dining. Within a few short years North Americans and many Europeans became extraordinarily obese on the high refined carbohydrate and polyunsaturated oil diet. Starved of animal fats, they were continuously hungry and couldn't stop eating. Into this most unsatisfactory situation came a new interest in the Banting diet. Of course, it was immediately controversial. Having been told for a generation to steer clear of animal fats, the obese are now being encouraged to consume unlimited high cholesterol food, but to strictly limit all carbohydrate. What is firstly not clear is whether this diet is advocated for the obese only, or is it for all? Reading the real meal revolution by professor Tim Noakes and three colleagues, one gains the distinct impression that simply everyone should be avoiding fruit like apples, all whole grains, legumes and starchy vegetables like butternut. The big plus of Banting is that it really works; the obese lose weight and the continuous nagging hunger of the Keys high starch diet can be avoided. Moreover, despite the diet being high in saturated animal fats, the total cholesterol levels drop, as does blood pressure. Diabetics find themselves better controlled and able to reduce their medication. Within the medical fraternity there has been considerable antagonism to this move to a high animal fat diet; fears of rampant heart disease trouble many. Already Banting diet rebuttals are pouring in. On the other hand, there has been considerable support for change; the high carbohydrate diet of Keys is clearly not working, and the change to polyunsaturates and hydrogenated fats has resulted in a huge increase in inflammation of joints, muscles and organs; and of arteries too. Says, veteran heart surgeon, Dr Dwight Lundell, despite the adherence to low animal fat diets and reliance on statin drugs to lower cholesterol, the inner lining of arteries become relentlessly more red and inflamed. Cardiovascular disease is certainly not under control. To add to the confusion, scientists doing a review of over 70 research projects have now declared that there is absolutely no scientific evidence that a change from butter to margarine and polyunsaturates would decrease heart disease; there's as much information for as against. Butter is back is the new catch phrase. So, professor Noakes has an impressive list of research reviews arguing that animal fat is not the problem; carbohydrate is. At the end of the day, whatever qualms you may have about this high animal fat diet, if it works for you, as it has for many, the risk of premature death is greatly decreased if you can get your body mass index below 30. Use the chart below to measure your BMI. A group of researchers in the Netherlands under the leadership of Dr Anna Peeters found that obesity was associated with a 6 to 7 year decrease in life expectancy; if you are obese and a smoker then it's a 14 year loss. That's your retirement gone up in smoke; worse is the disability and pain that dogs the joints of those who are significantly overweight. What are our qualms then? Why the banting diet rebuttal? Does the Banting diet have any meaning whatsoever for those who have a normal BMI, whose blood sugar, cholesterol and pressure are all quite normal; who are in good health and have plenty of energy? How long should obese people on the Banting diet avoid foods for which there is much research proving their benefits; foods like butternut, apples, beetroot, tomatoes and legumes for example? Is buttered bread smeered generously with honey really the devil in disguise? Even low GI bread and raw, lightly filtered honey that is full of pollen? What about homemade jams and jellies? Are they recommending that all bread should vanish from our supermarket shelves? Half the world get their protein from legumes and not from meat; are they quite wrong, and seriously unhealthy? Should none of us be enjoying fresh green peas from the garden, or lima beans, or even dried butter beans? Should the Japanese and Chinese be avoiding all whole grain rice? Should South Africans and Americans be shunning corn on the cob? Can a vegetarian bant? With no desire for pork crackling and a total need for chickpeas, lentils and pulses for protein, does the Banting diet have anything to offer? And for vegans who have no desire for eggs, cheese or butter? Whilst on a true Banting diet, there should be plenty of B6 from all the green veggies, I'd still like to see some research on the levels of homocysteine in Banters. It's such a toxic breakdown product of protein metabolism. Is all that bacon that is advocated healthy? There's plenty of research convincingly proving that processed meat and particularly fat increases colorectal cancer. Fat, meat, alcohol, and low-vegetable or low-residue diets are fingered in the journal of Pharmacology published by Karger. Grasping the meaning of the term glycemic index is the right way to lose weight permanently; do you understand it? Most of us would agree that those carbohydrates that are rapidly digested and give a surge in blood sugar, followed by a steep rise in insulin, should be avoided by the obese and diabetics, and eaten only in moderation by those who are healthy. Foods, if you can call them that, like white bread and rice, chocolate cakes and bagels and even potato if you are seriously overweight are to be avoided. But what about all those healthy carbohydrates (in my opinion, anyway) that have a low glycemic index? Those that do not engender an insulin surge; like apples, hummus and butternut soup? In this Banting diet rebuttal, there is no restriction of these starches. 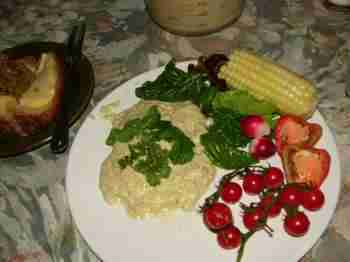 Likewise, corn is a very healthy grain, eaten fresh from the garden. Are all pastas to be described as a total NO-NO? The way a starch is prepared greatly alters its glycemic index. This carbohydrate count chart and glycemic index will give you a better idea of this scale. Any diet that gets the weight off, but doesn't keep it off, for my money, is a fad; a fashion so bad that we will have to change it again next year; in fact research strongly indicates that no diets work; sustainability is non existent. This week I met a man who lost 35kg on the Banting diet, but just couldn't avoid some of his favourite foods for ever; he's put 26kg back on. Are we simply going to say that he's weak, and that anecdote is irrelevant? Had he continued with a slice or two of low GI bread a day, smothered in butter, and our authentic hummus recipe, perhaps it would have been more sustainable for him. I think I should state up front in this Banting diet rebuttal that I believe in many aspects of the high fat, low carb diet; it obviously works to get the pounds off and that can only be described as beneficial. But what happens after you have returned to a normal BMI? And I emphasise the fats from the olive and avocado, rather than that from bacon, as is the craze here in South Africa. Processed meat is known to cause cancer; it's proven beyond a doubt. BMI is the way to grasp how urgent your problem is? It stands for body mass index. You should understand the term if you want to live long in the land; it has a direct influence on how long you will survive, and on your general well being. In this Banting diet rebuttal we certainly don't consider it a healthy diet for those with a normal BMI. But the obese end up having to take massive doses of anti inflammatory drugs for foot, knee and back pain and that has a seriously detrimental effect on your future quality of life. Understanding where you lie on the body mass index scale, what glycemic index is about, and heeding the warnings at this Banting diet rebuttal will enable you to get the pounds off safely and permanently. Even worse, taking dual antiinflammatory drugs will seriously affect your quality of life. Free weight loss programs are a better way to do it; it's not a diet. Rather than what I see as yet another radical, and unsustainable diet, I'd prefer to see you making the changes listed in our free weight loss programs; that means not cutting out all the healthy starches like apples and legumes, and a moderate shift to butter, olive and other cold pressed oils, avocados and fatty fish. Even if you are morbidly obese like the man mentioned above, if the Banting diet means a dramatic but temporary weight loss, it's done you no good at all. Think rather of our Banting diet rebuttal as a way of life for the rest of your days; it's not onerous unless you think you simply cannot survive without chocolate cake, bagels and colas every day. Enjoy your butternut soup, fattened with high cholesterol coconut milk but, no, you can neither have your cake, nor eat it. Not if you want to enjoy your retirement. White flour, white rice and sugar are banished for ever; except on high and holy days. Prunes for breakfast, for you know what, a tablespoon of soaked oats with full cream yoghurt and a teaspoon of raw honey, if you can find it, should still be on the menu. Every diet on the planet is in agreement about a daily green salad; enjoyed with a squeeze of lime juice and a dribble of olive oil, lettuce and celery, baby spinach leaves, a parboiled jalapeno... it's a vital in every diet and should be daily on the table. It's even healthier than the Banting diet; if only because it's sustainable. That's hummus, and homemade low GI bread smeared generously with butter, raw honey and full cream brie cheese on the side. Every month it's different; corn on the cob today, avocados tomorrow, radishes throughout the year, and rarely without our healthy hummus recipe. How to grow corn is so easy to follow; through the summer I enjoy two cobs a day, with no weight gain. You'll find it all at our free weight loss programs. Research published in Plos One combined the research from 19 different studies involving over 3000 obese persons. Participants consumed the same number of calories, but comparing the effect of low versus high carbohydrate. Critics of the Banting diet said there was no difference in the weight loss; nor did it happen faster. Unfortunately they didn't track how hungry people felt. Noakes' response was that those on his low carbohydrate high fat diet feel more sated leading to a lower caloric intake; they ate less and thus lost weight faster. Moreover, these researchers from Stellenbosch University and Noakes weren't comparing apples with apples. For Noakes a low carb diet means less than 50g of carbohydrate per day; the researchers' criterion was 200g per day, or four times as much. Rome wasn't built in a day and clearly more research will be forthcoming. Right now I would suggest you rather follow this Banting diet modified; it's a healthier way to lose weight. There are many specifics related to certain carbohydrates and disease. For example, men who eat a tomato a day have fifty percent less prostate cancer, the most common serious malignancy in men. Despite the fact that tomatoes, for example, are in the very low GI category, they do contain significant amounts of carbohydrate. Seriously limiting the carbohydrate and cutting out otherwise healthy foods like tomatoes, apples, legumes, butternut and a host of other carbs may help lose weight, but is also likely to increase the risk of getting serious cancer. It's this extremism of the Banting diet that makes me call it yet another fad; by all means cut back very hard on high GI carbs, especially if you need to lose a lot of weight, and a moderate increase in fat, particularly if it includes the olive and avocado, is fine by me as a chiropractor. You need plenty of oleic acid for your nerves, and lutein helps prevent eye diseases. To go from Banting diet rebuttal to Free weight loss programs. Return from HFLC diets to Quaker Oats recipes.